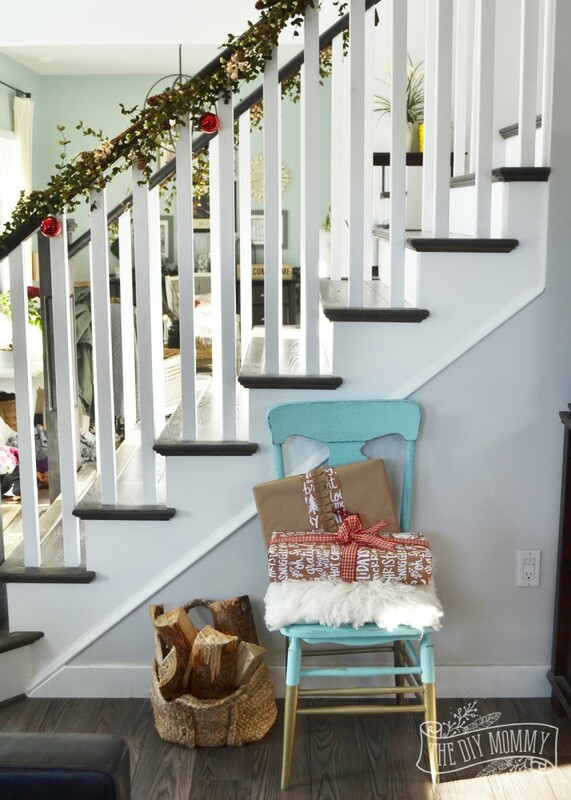 Christmas is my favourite time of year and I adore decorating our home for the season. 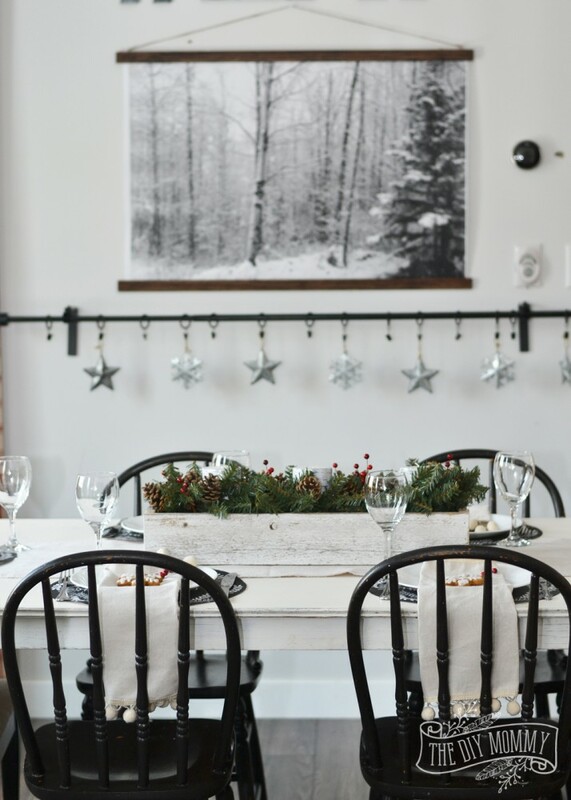 This year, I’ve teamed up once again with a fantastic group of Canadian bloggers to share with you our Holiday home tours. Scroll to the bottom of this post to see the line-up for the week – you’ll be so inspired! Our decor this year is a little traditional (I’ve brought back the red), a little country, and a little quirky. 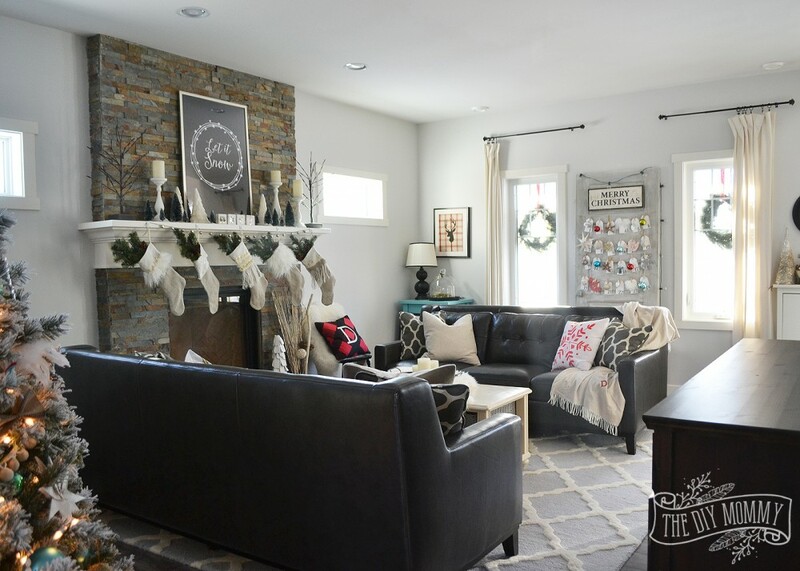 As always, I’ve incorporated lots of DIY elements, vintage elements, and family-friendly additions that make our house ready for any family gathering this Christmas. 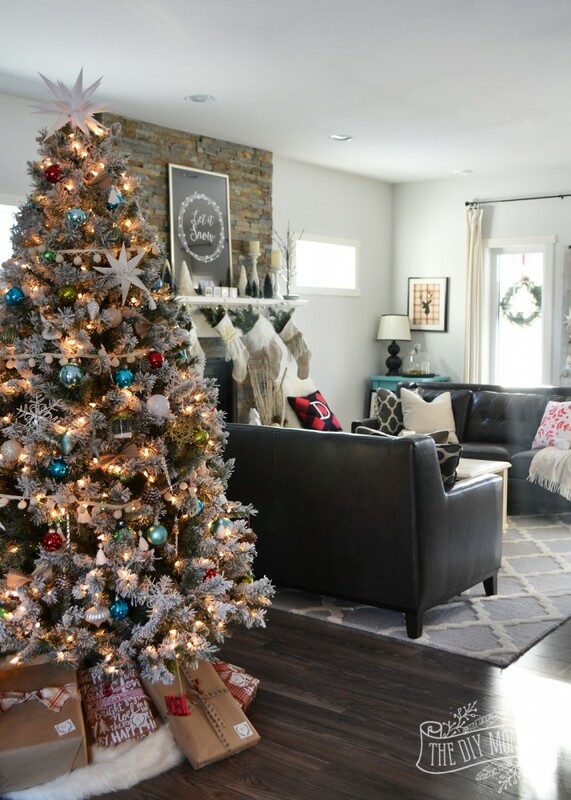 I hope you enjoy this year’s Christmas home tour: A Canadian Prairie Christmas! 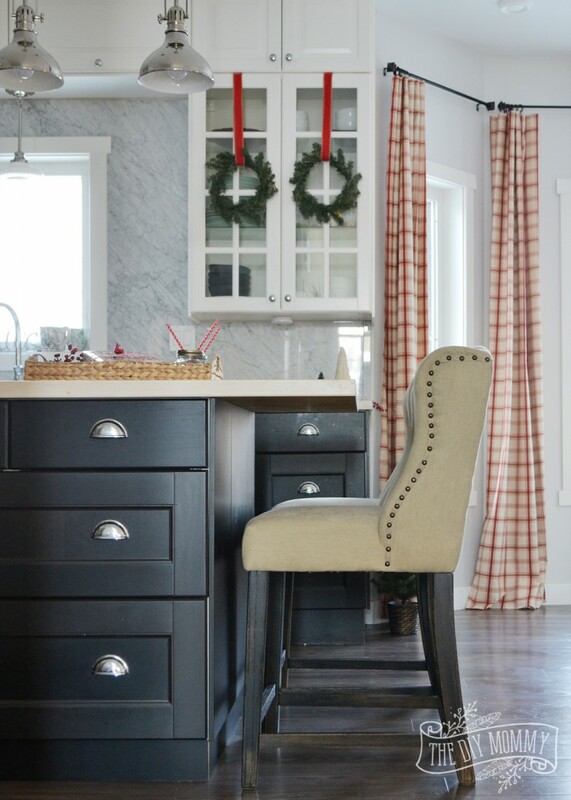 Stay on the lookout for DIY Tips, Styling Tips and Free Downloads scattered throughout this post. I want to make sure you leave this page with some free goodies. Welcome to our home. You’re just in time for the first big snowfall of the year! Usually we have a lot more snow up here by now (we’re in Alberta, Canada). This year has been extra mild. We built our home all on our own in 2013. For more on that, read this post. This is our dog, Tippy. She’s the scariest guard dog you’ll ever see in your life. Styling Tip: Prop up faux evergreen trees in large buckets or baskets on either side of your front door for instant and inexpensive Christmas curb appeal. Styling Tip: Use a blanket scarf as an outdoor throw on porch chairs. Click here to learn how to make one. 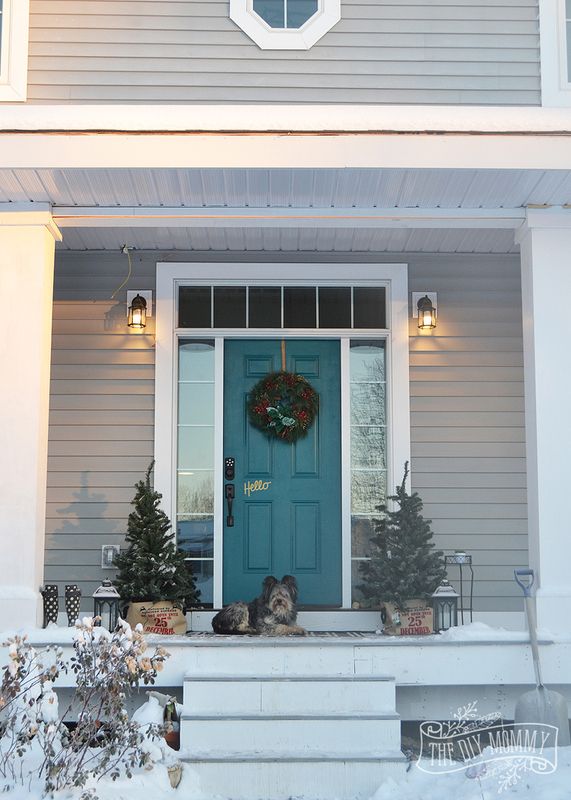 I hung wreaths from all of our lower front windows, and I love the look! It’s just so very festive. 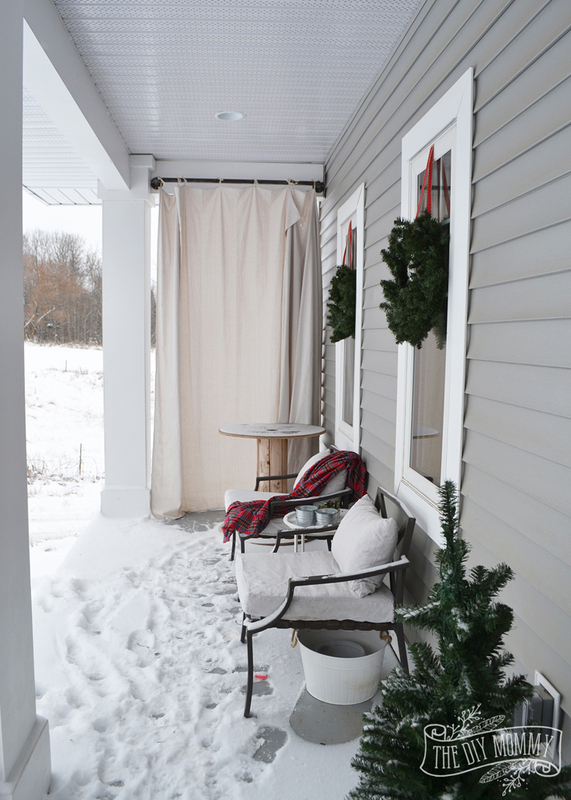 DIY Tip: Click here to learn how to make a porch curtain out of a dropcloth. 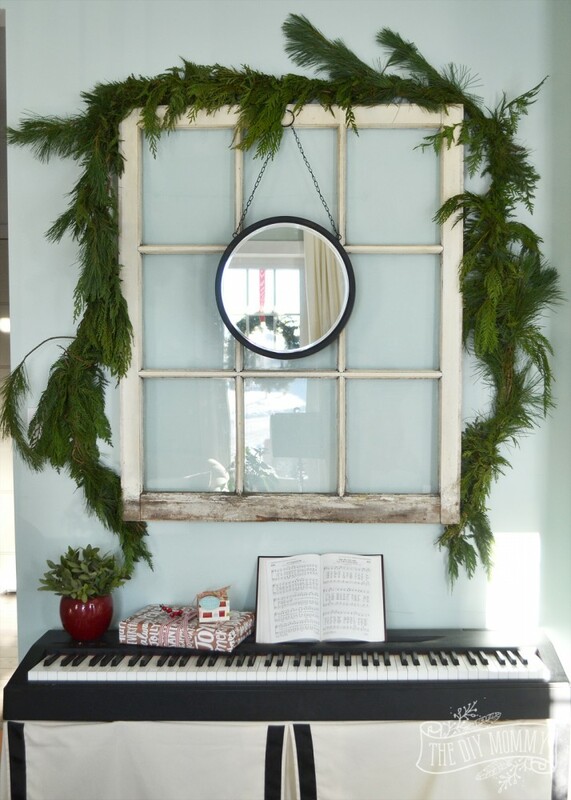 Here’s the first thing you see when you enter our home – my keyboard & this lovely antique window & mirror! It’s in our formal sitting room, and I’ll share more of that room later. 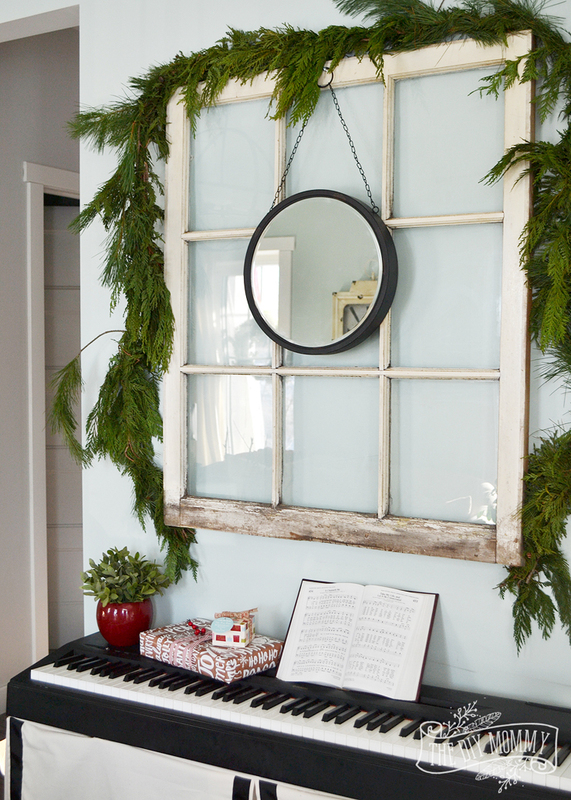 Styling Tip: Mix real greens – like this cedar and pine garland with faux greens – like this little plant – for a sneaky combo of higher and lower-end cost Christmas decor. Our entry cabinet on the other side is decked out with the bowl of pinecones from the Fall with the addition of some fresh greens and a sparkly tree decoration. 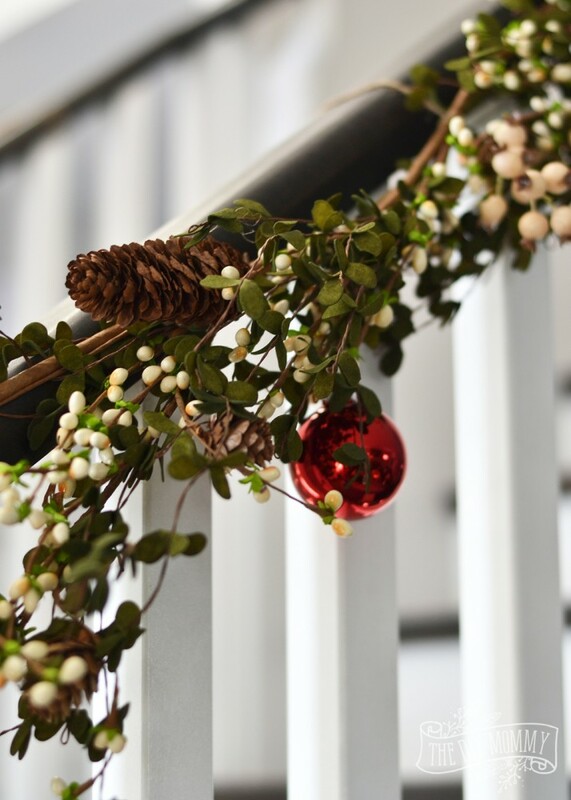 On our stair railings, I’ve tied some beautiful faux boxwood garlands and adorned them with sparkly little red ornaments. Come on in to the family room! Here’s where we spend most of our time as a family. Do you spot anything new here? I finally have the couch pair of my dreams! I’ve always wanted a matching pair of sofas for this room, and when I spotted these lovely leather sofas from The Brick, I knew they were just the ticket. This is the Davina Genuine Leather Sofa, and I love its mix of contemporary and classic. 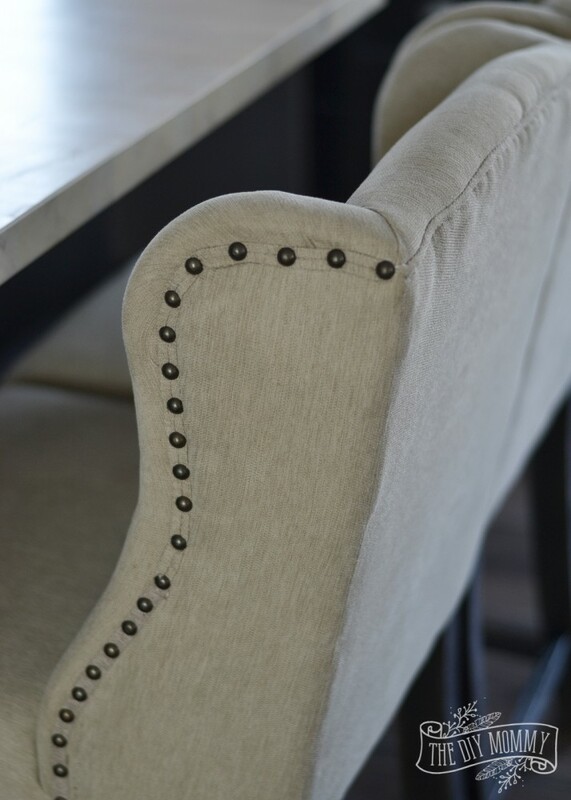 The tufting on the back is so chic, and I’m in love with the wooden trim and legs on the bottom. These were delivered all the way out to our house from The Brick, and it was a great experience! The delivery guys were lovely and I couldn’t be happier with our new pair of couches. As much as I like the look of light furniture, I will always go back to dark leather for our main pieces (like these couches). Especially after the “pink marker disaster of 2015”, dark leather is such a great choice for my little (and mischievous!) family. 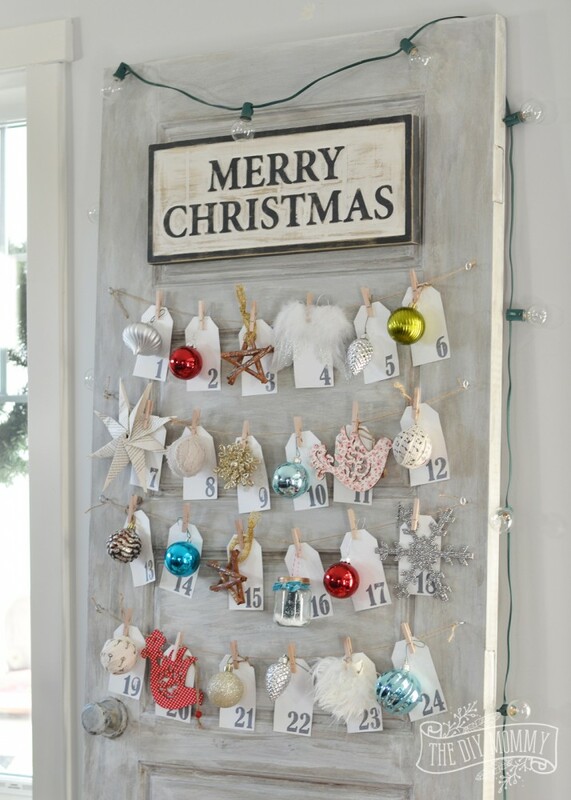 DIY Tip: String ornaments & tags on an old door for a fun & unique advent calendar. For the free printable tags and more instructions, visit this post. I found this beautiful Merry Christmas sign from Woodwerx. 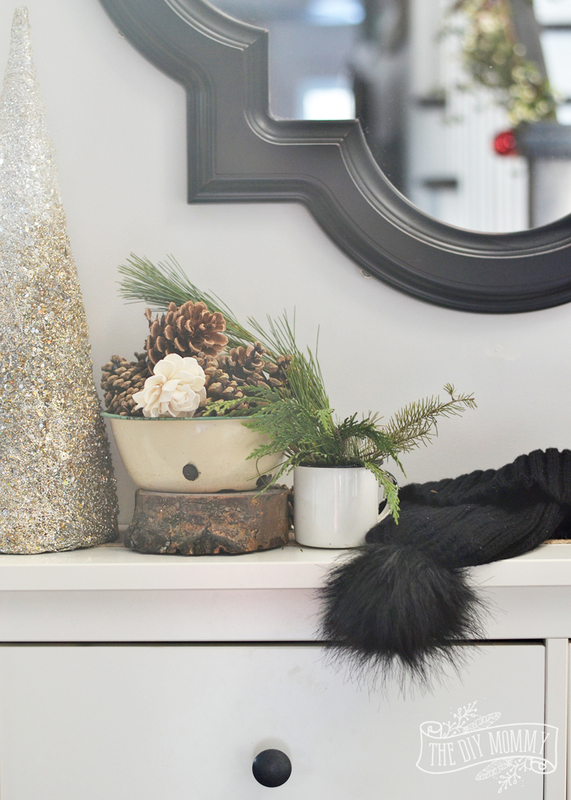 Our Christmas mantel this year is a fun mix of little trees, neutral colours, and tons of texture. There’s lots going on here, so I opted for a soft pallette of white, black and green for the mantel decor. 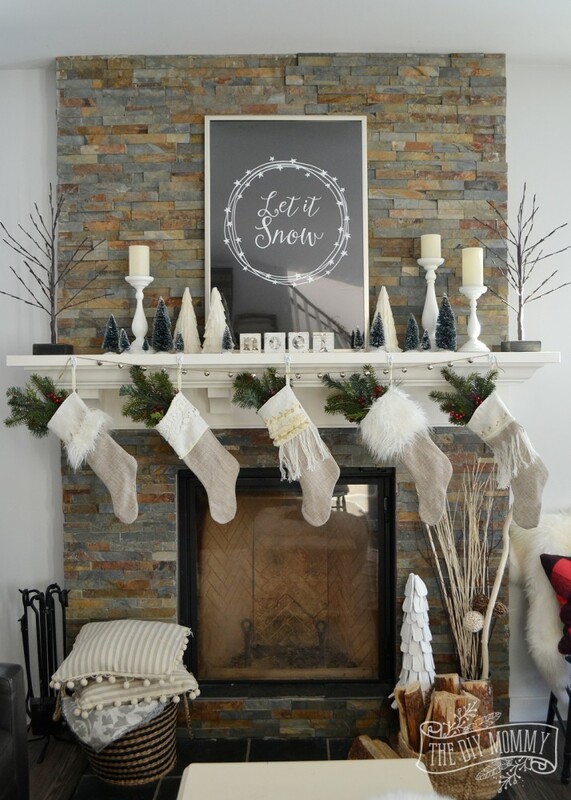 Free Download: Download your free PDF copy of this “Let It Snow” artwork I made for our mantel by clicking here. It’s a large 24″ by 36″ design that you can get printed at your local copy shop as an engineering print. DIY Tip: Click here for a free pattern and tutorial on how to make these linen burlap Christmas stockings. 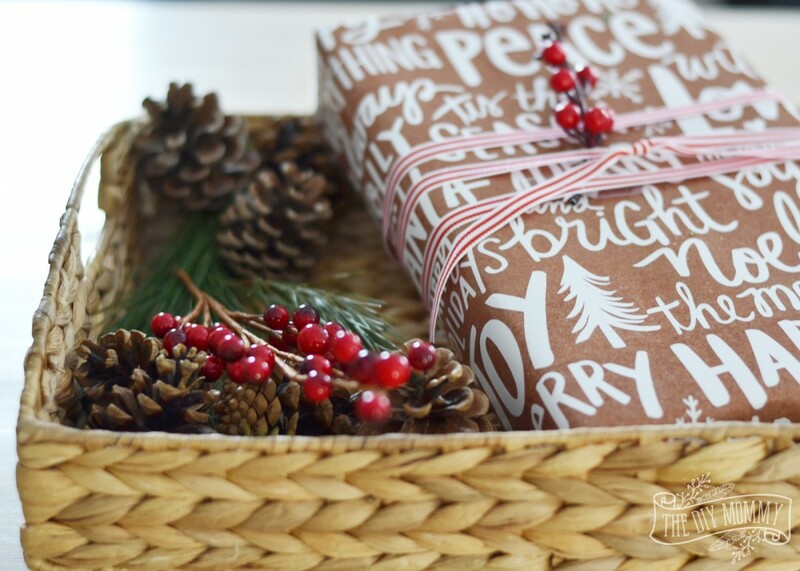 DIY Tip: Tie some silver bells onto some rustic twine for an adorable and festive garland. 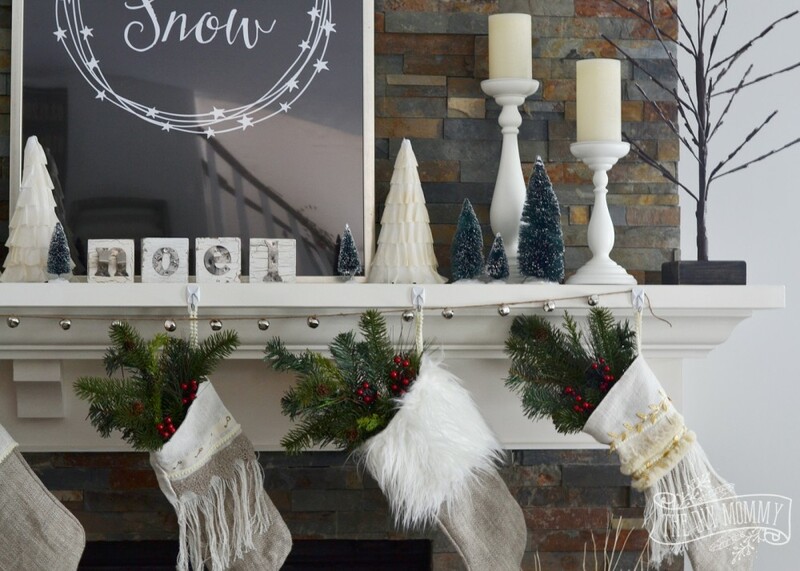 Styling Tip: Stuff stockings with faux greens until they’re stuffed with gifts! 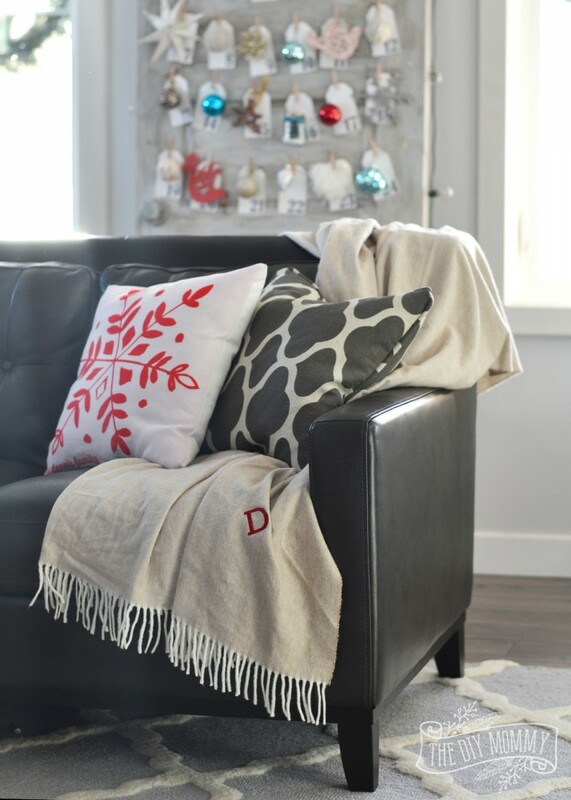 Styling Tip: Place a basket or two near your sofas to store extra pillows and blankets inside. Styling Tip: Reserve a few sprigs of greenery from a live garland to use in other places around the house like this coffee table tray. Tucked in the corner of our living room is our nativity set that the girls love to play with. Our tree this year is decorated almost the same as last year’s, but I’ve sprinkled a few red ornaments throughout. It’s amazing how much of a difference only a half dozen red bulbs makes! Now, come into our kitchen. It’s the heart of our home! With a four year old daughter that LOVES to bake, we spend a ton of time in here too. I had a little fun this year and decided to make some new drapes for our breakfast nook in a festive red plaid. 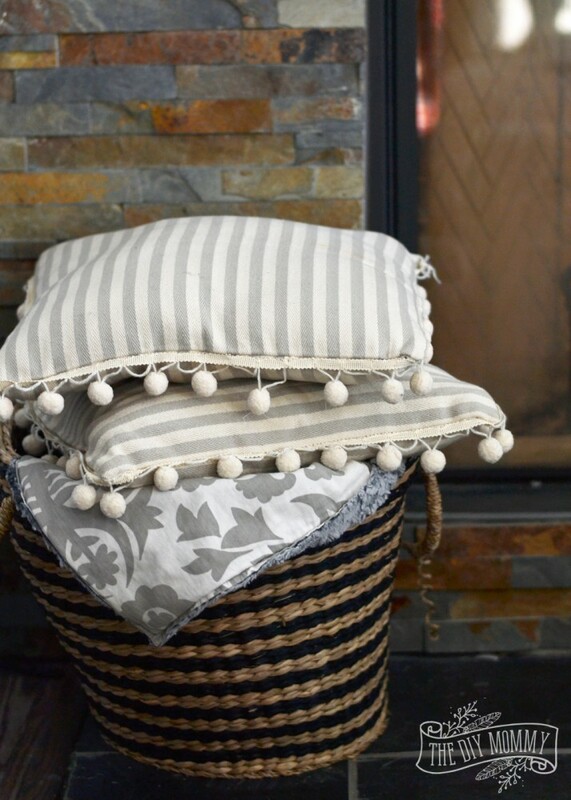 DIY Tip: Learn how to make your own easy rod pocket or ring clip drapes by clicking here. 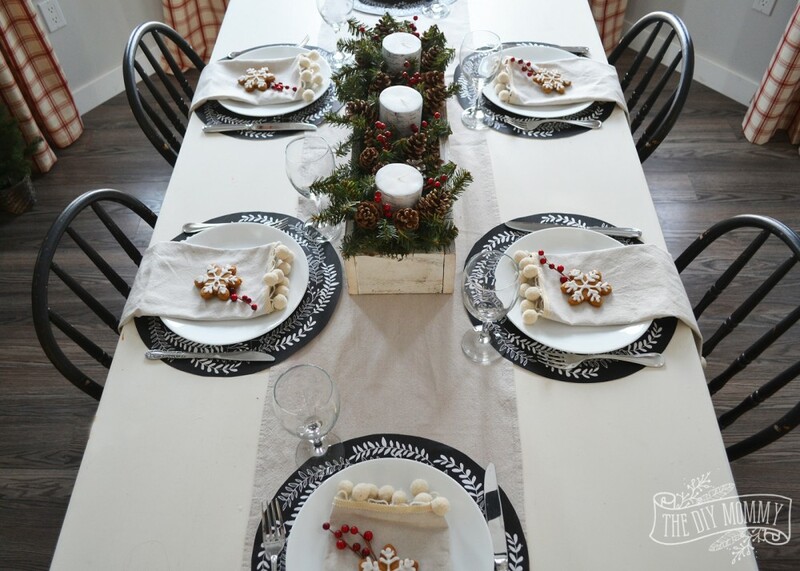 For this year’s Christmas table setting, I opted for a colour scheme of black, white and red. 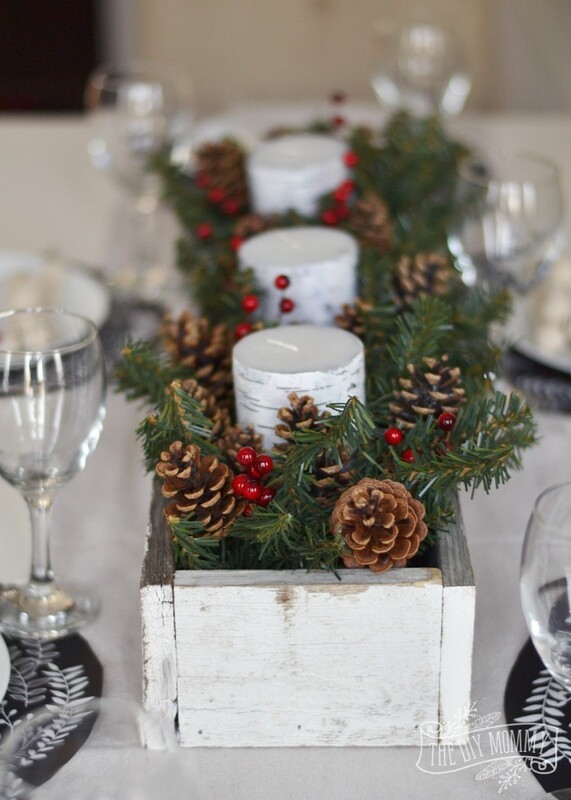 I’m still madly in love with this rustic centerpiece box my friend made for me, and I’ve filled it here with faux greens, pinecones, candles and faux berries. 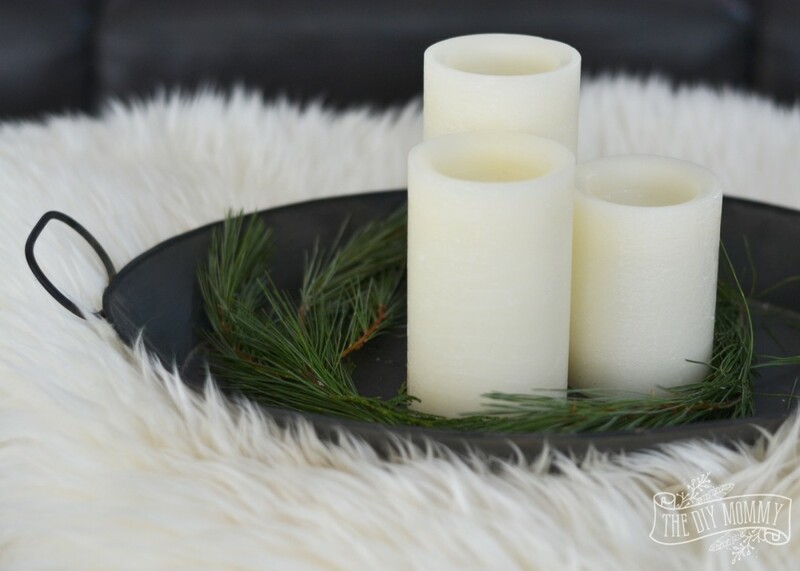 Styling Tip: Save old faux garlands to use as centerpiece accents or to cut and use to embellish gifts. 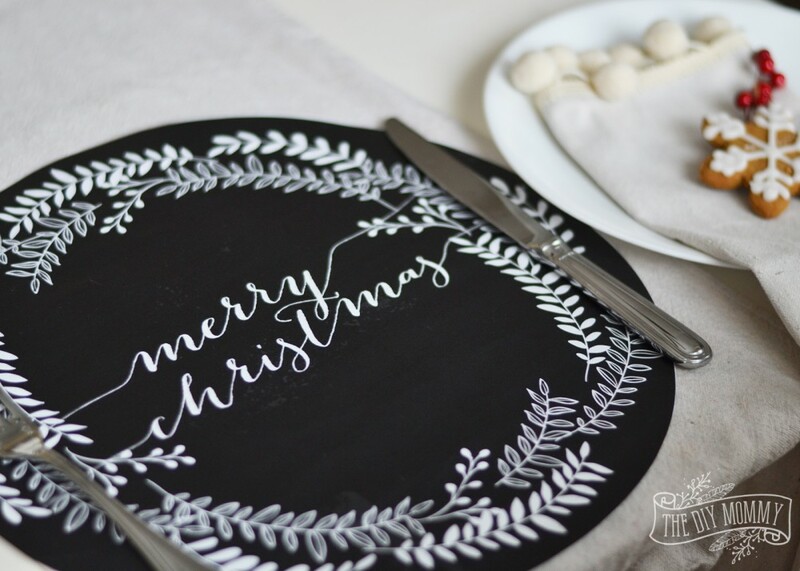 Free Download: Click here to download your free PDF version of these black and white Christmas placemats. 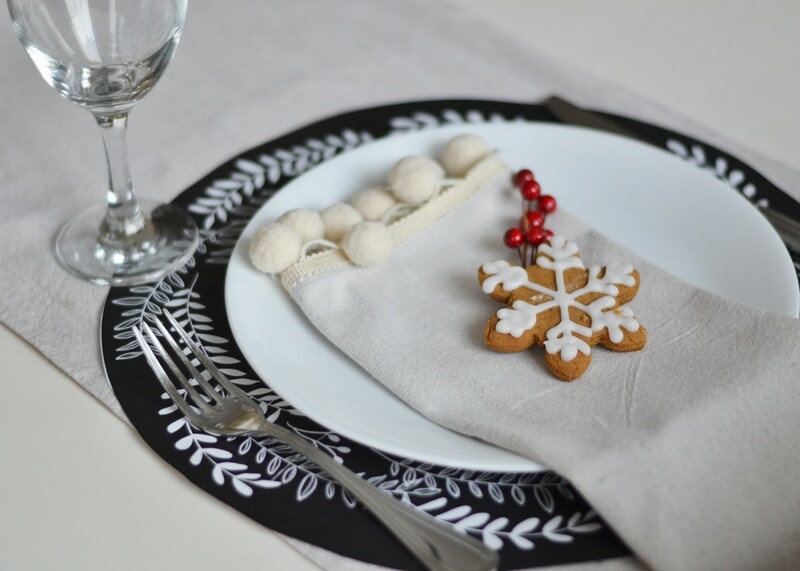 On top of my napkins, I placed some faux berries and a gingerbread cookie. 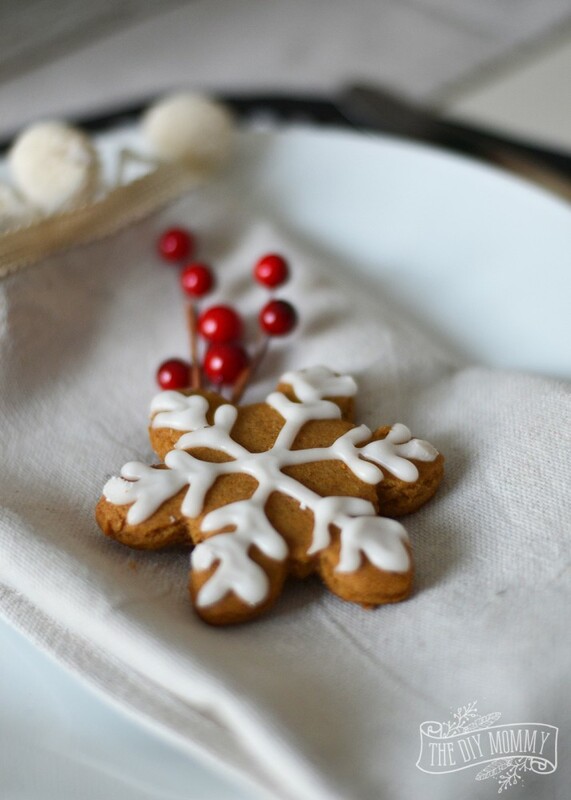 DIY Tip: Here’s my favourite gingerbread cookie recipe! 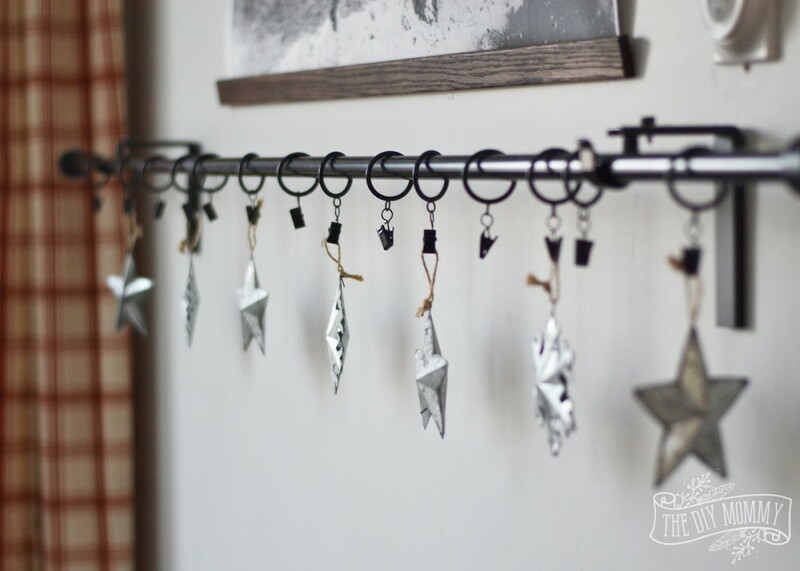 Hanging on our art rod are these sweet galvanized ornaments. 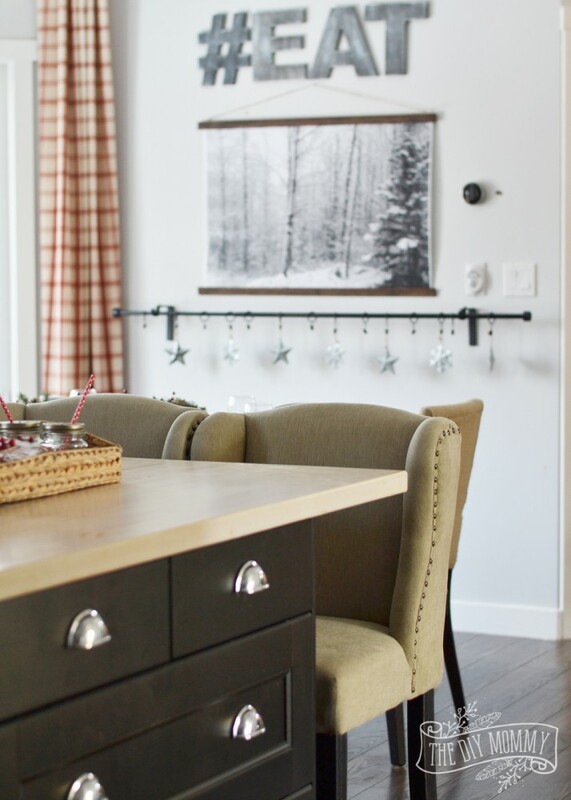 DIY Tip: Learn how to make this large Winter wall hanging by clicking here. We have some new furniture additions in the kitchen, too! Meet our new stools – also from The Brick. I wanted some more neutral stools for our kitchen to coordinate with the new drapes. I was also looking for something comfortable and safe for our kids. 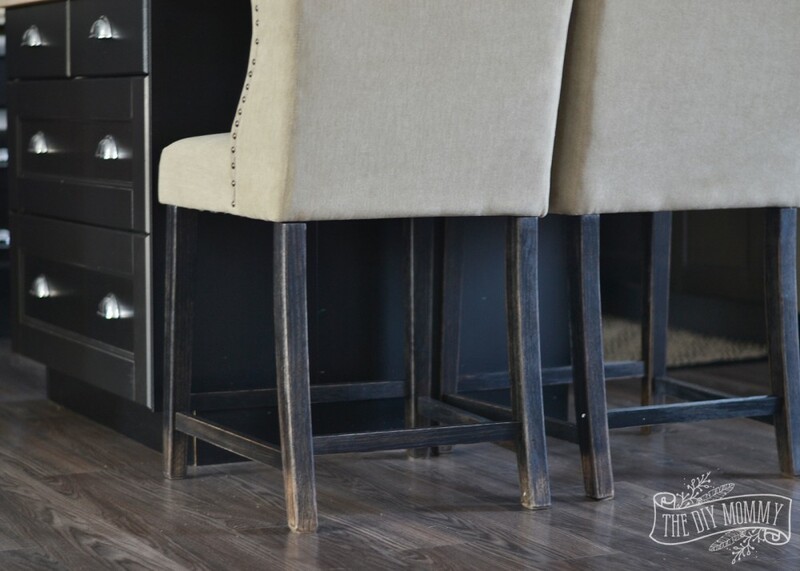 These beautiful Moriann Counter Stools were perfect! I love the wings and the nail head detailing. The distressed legs are one of my favourite parts, too! 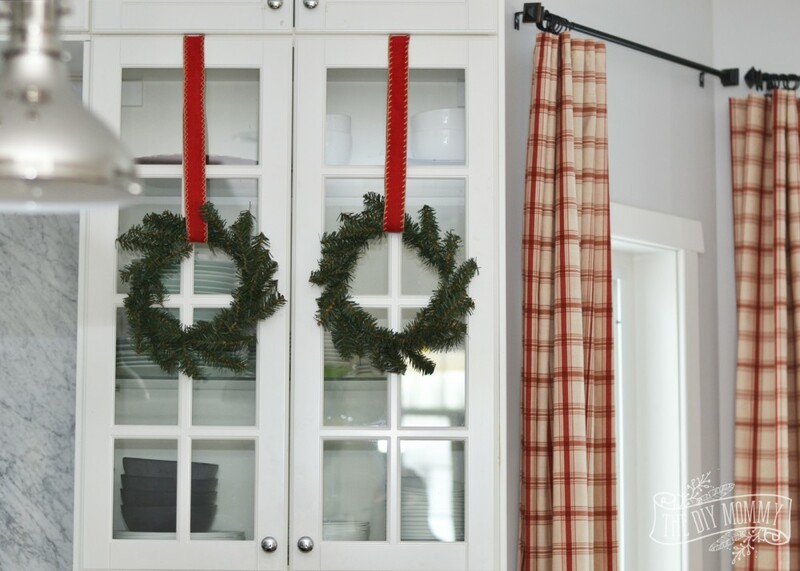 I hung wreaths on our kitchen cupboard doors like last year, but I changed the ribbon to red to tie into the drapes. DIY Tip: Form old faux garlands into a circle and secure them with floral wire to make inexpensive Christmas wreaths of any size. 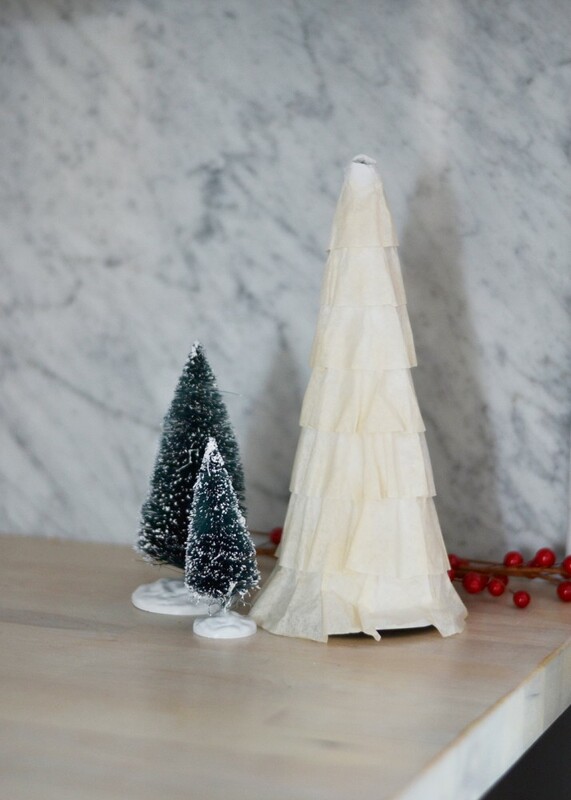 DIY Tip: Glue the edges of coffee filters to a styrofoam or scrapbook paper cone to make ruffled tree decorations. Styling Tip: Corral various seasonal and kitchen items on your counters with a pretty tray. 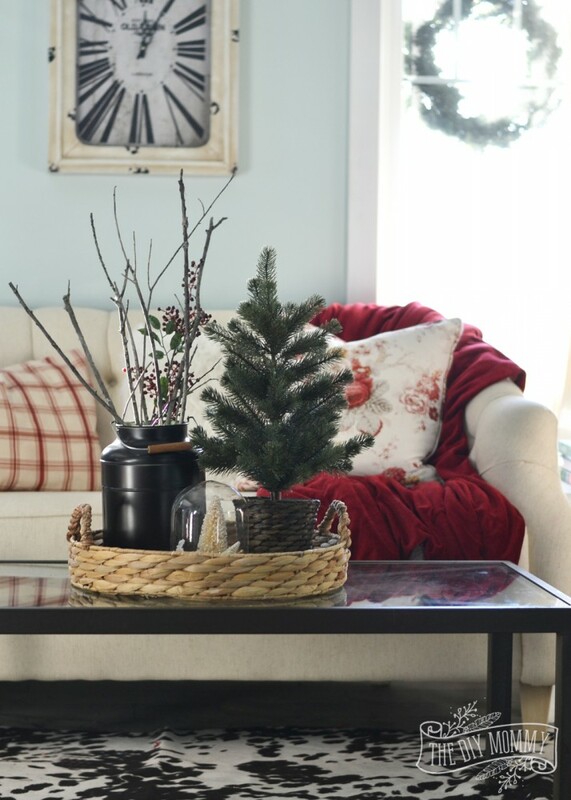 Around the corner in our front room, I’ve added a plush red throw to the settee for some festive cheer along with a faux evergreen and a snow globe to the coffee table. And here we are at the keyboard again! DIY Tip: Learn how to sew your own keyboard or side table fitted skirt by clicking here. Last but not least, here’s a cozy last look at our master bedroom. 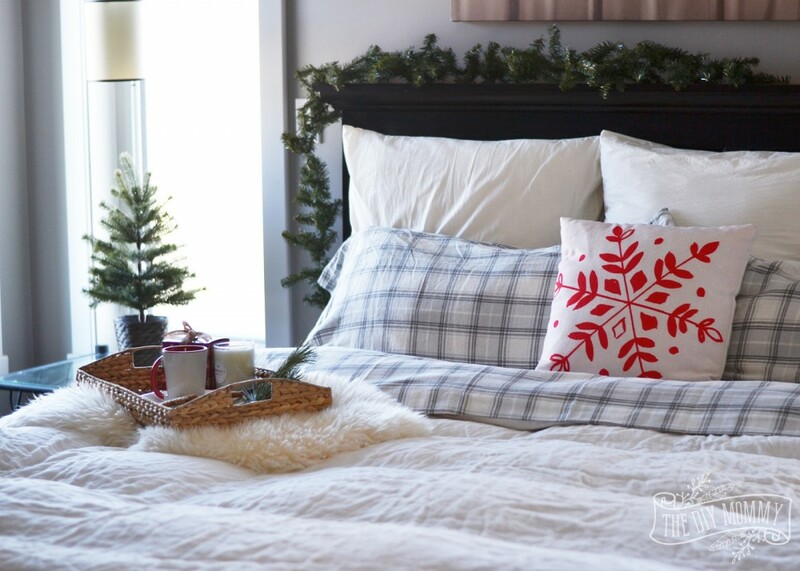 The addition of some faux greens and changing out the textile to cozy picks like linen, fur and flannel makes our room feel warm and festive. Care for coffee and a cookie? This is stunning! I am loving the new curtains in the dining room, perfect addition! You have such an attention to details in your home, I am always so inspired. LOVE LOVE LOVE!!!! 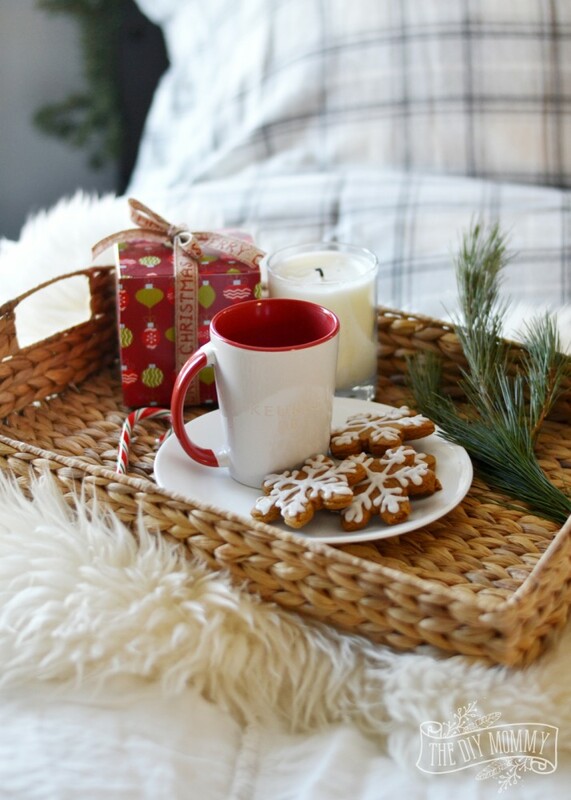 Everything about your beautiful Christmas home is wonderful! Your home is beautiful! I love the advent calendar on the door! I miss Canada so much! We used to live in Kitchener, Ontario, close to Toronto, and I loved it. ( my husband is canadian) Except for the long cold winter, but I think it probably wasn’t as cold as it gets where you are in AB, right? Lovely house! Canadian houses are the Best!!! Thanks, Katrin! Yes, it gets very cold here. Usually in January it will get to -40 celcius on some days! I don’t love that, but I do love the snow and all of the beautiful scenery we have. Thanks for visiting! So lovely Christina! Everything looks so cozy and festive. Love all the greenery. The new sofas and stools look perfect! I have been looking forward to seeing my fellow Canadian bloggers on this Christmas tour. Your home is lovely and so nicely decorated for Christmas. 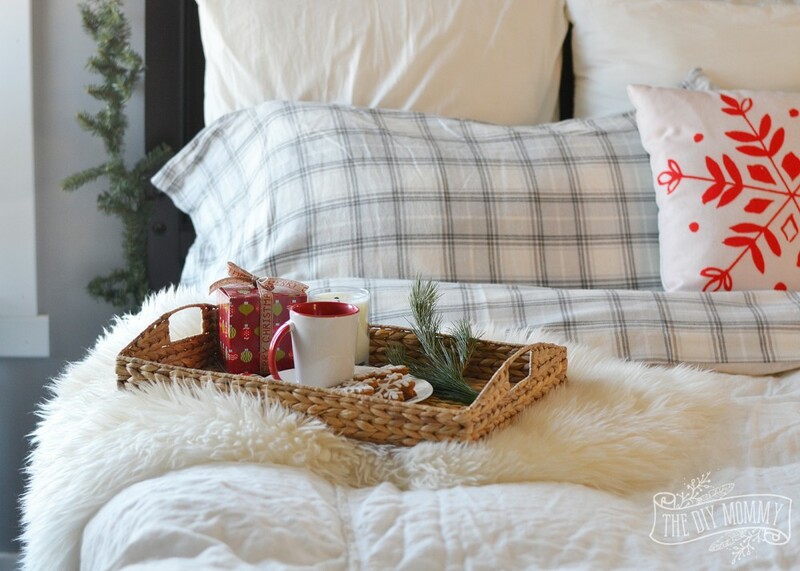 Very cozy and so many pretty touches. The tree is beautiful! We have had a milder Fall right into November here in southern Ontario as well. Thanks for sharing your tour! Thanks, Elizabeth! I’m actually really enjoying the milder weather. I hope it lasts a little bit longer! Stunning! I always love your home tours, your decor is beautiful! I always love your hone and style Christina!Elegant and beautiful but still feels like home! Look forward to enjoying all these homes on thus tour! Thanks so much, Kendra! 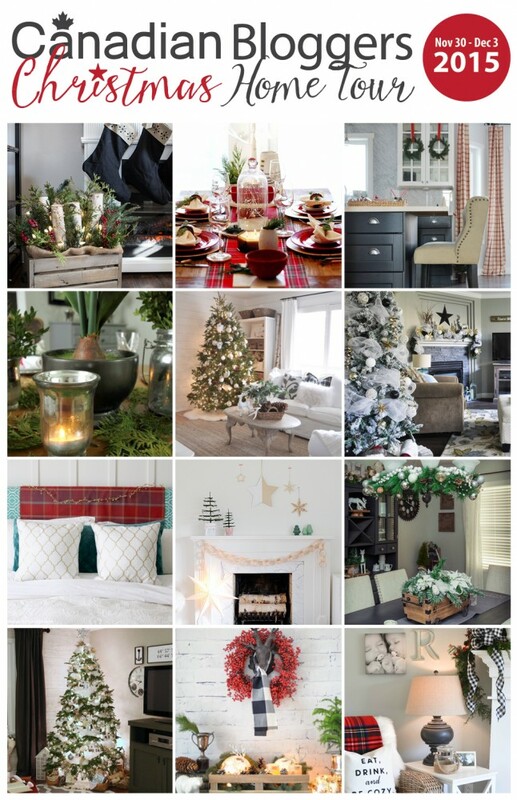 All of the homes are amazing… so many talented bloggers! 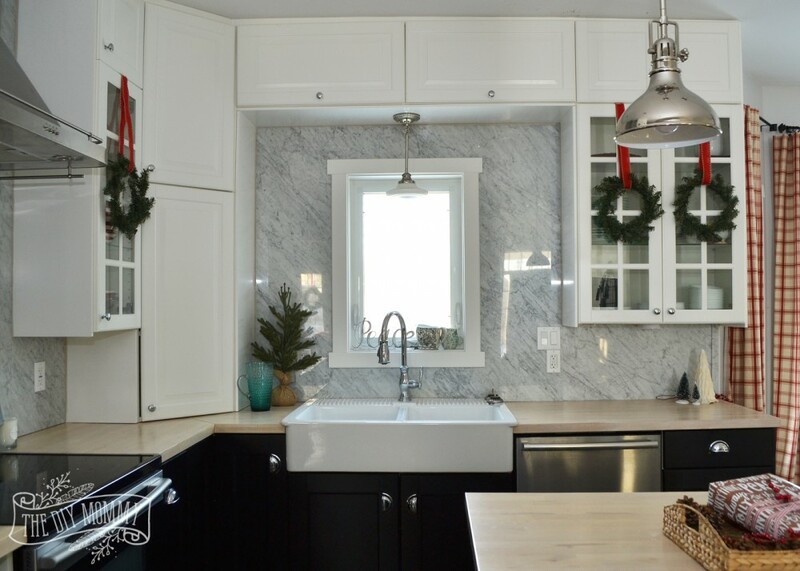 Courtenay @ The Creek Line House recently posted..Christmas Home Tour 2015! 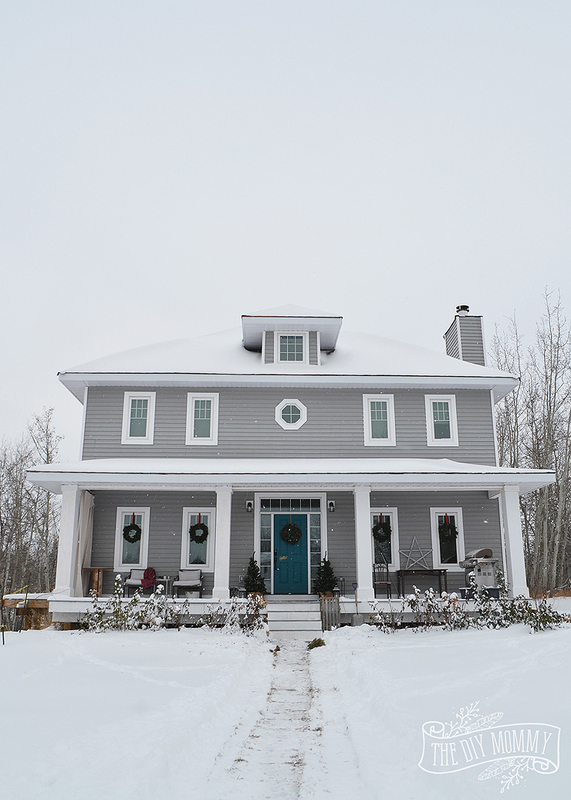 From one Canadian Prairie girl to another, your home is beautiful inside and out! Thanks, Marie! I think the Canadian prairies are the perfect place to have Christmas! A beautiful tour, Christina. 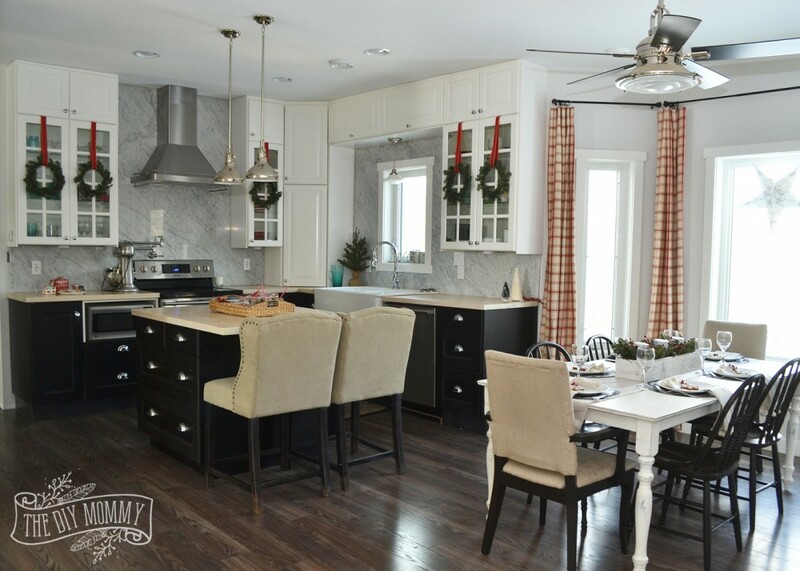 I love all the festive touches but that kitchen is where I’d want to hang out. The plaid curtains are so lovely! Wow, Beautiful home tour Christina! So inspiring, need to look through it again to catch all the details! Thanks, Kim! Have a wonderful week! Your home is beautiful! 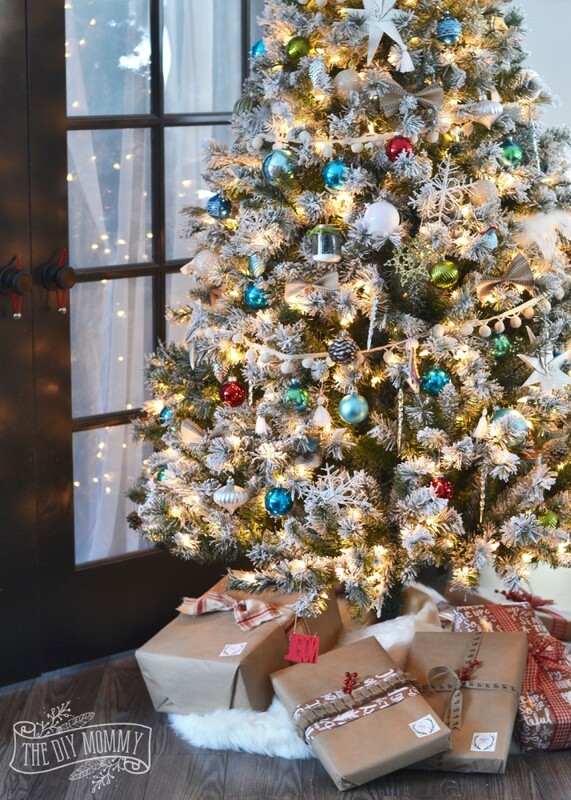 My favorite part is those star ornaments hanging from your art rod. They caught my eye right away. It’s all in the details haha. Thanks, Melanie! I love those too. It’s always fun finding different things to clip on that art rod! It is absolutely stunning from the first entrance through the snow! 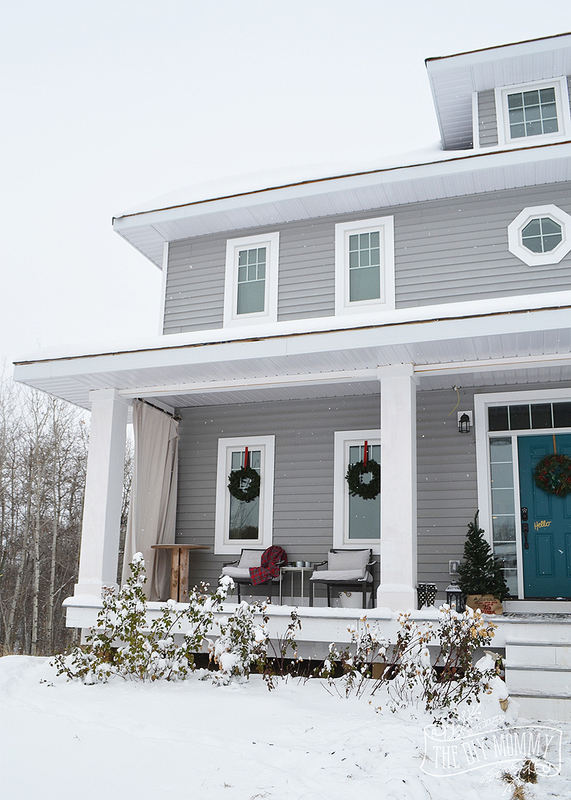 Our house never looks like that… we so rarely get any snow. Just west-coast-wet. Ugh. And the new drapes! And wreaths! And stools!! I love so many touches Christina and admire your beautiful style!! Thanks, Krista! Sometimes I do long for a warmer climate, but I do love the beauty of the snow and my girls really love to lay in it. Thanks for visiting! I’ve not been well enough to decorate for Christmas yet, so I love looking at what you’ve done! I never thought red and teal would go together, but you make it work. Great job! You’ve also totally got me crushing on pom-pom trim now. And I love your new sofas! Thanks, Sara! I don’t know why I’m so obsessed with pom pom trim these days… maybe because I found a whole reel on sale? 🙂 I hope you get better soon! So so so very beautiful as always! I love seeing your beautiful home. Your family is truly blessed by your awesome God-given talent! You have such a beautiful home! I love the big windows in your family room! 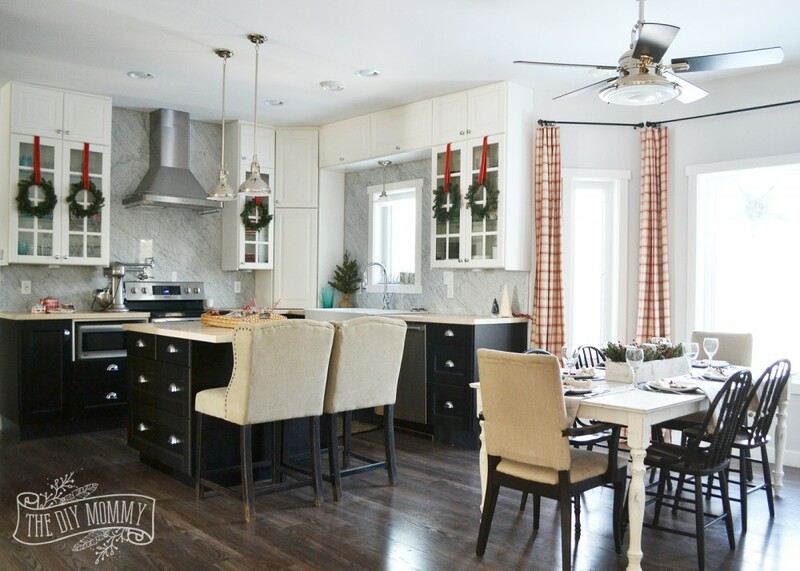 From one Canadian blogger to another her home is Gorgeous!! That art rod is genius! I love how you hung ornaments from it. 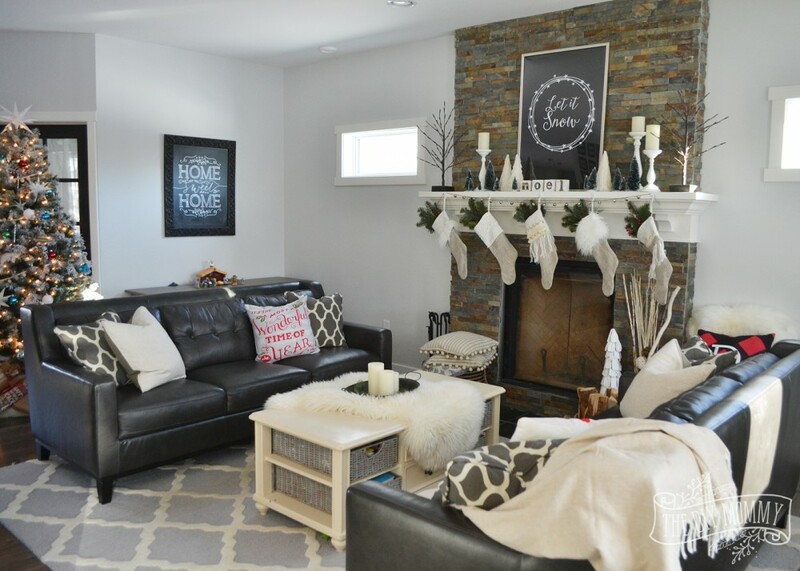 Christina – your space is just so lovely – it looks cozy, and homey, but still stylish. And your paper chargers – genius! I love it. Your home is absolutely stunning! So cozy and inviting! 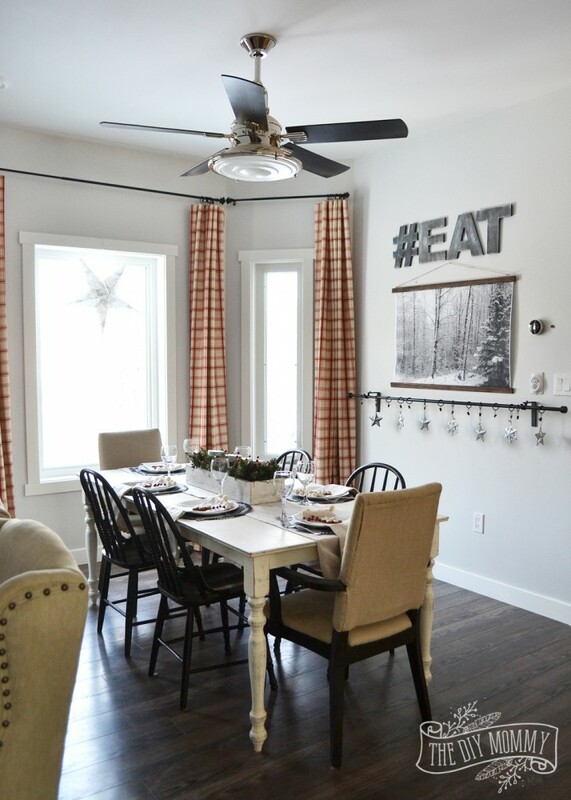 I love the idea of the rod with the hanging decorations! 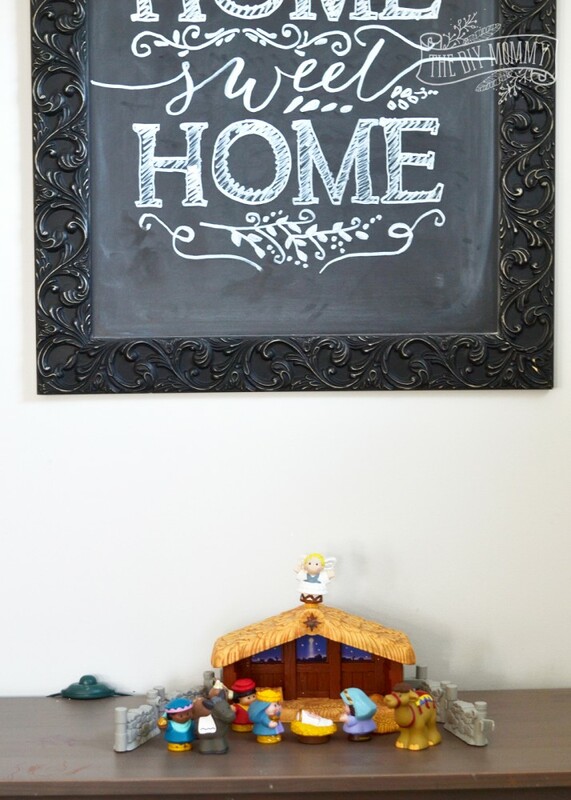 Jill recently posted..Holiday Mason Jar DIYs & 12 Days of Giveaways – Day 8! Your house is very beautiful! I had no idea that it was new! It looks like something built many years ago and beautifully maintained. Your Christmas decor is lovely, I love all the red. Thank you for the chance to it. I have to ask, what is on your third floor? I think third floors look so mysterious and I can imagine a very cozy room up there. Also, I live in Winnipeg and I have seen many of the old mansions here that are built in the same style as your gorgeous home.